It’s time for Sunday brunches and Easter egg hunts galore once again. Easter 2019 falls on 21 April, so spring into our ultimate guide to 48 egg-venturous, egg-alicious and eggs-hilarating eggs-periences! Traditionally marking the beginning of Spring, Easter is the season of rebirth, renewal and family togetherness. What better way to celebrate it than by spending it with loved ones? Go on Easter egg hunts, meet-and-greet with the Easter Bunny, tuck into gourmet brunches complete with bubbly for the grown-ups – there’s something for every family. We’ll even tell you where to hatch the best treats, from quintessential Easter goodies to Easter weekend staycations! So c’mon, let’s get cracking! Everyone’s favourite lazy egg will be sunny side up at Jurong Bird Park this April. Snap photos with giant Gudetama figurines and a five-metre-high inflatable, then meet the egg-dorable character in egg-tion. 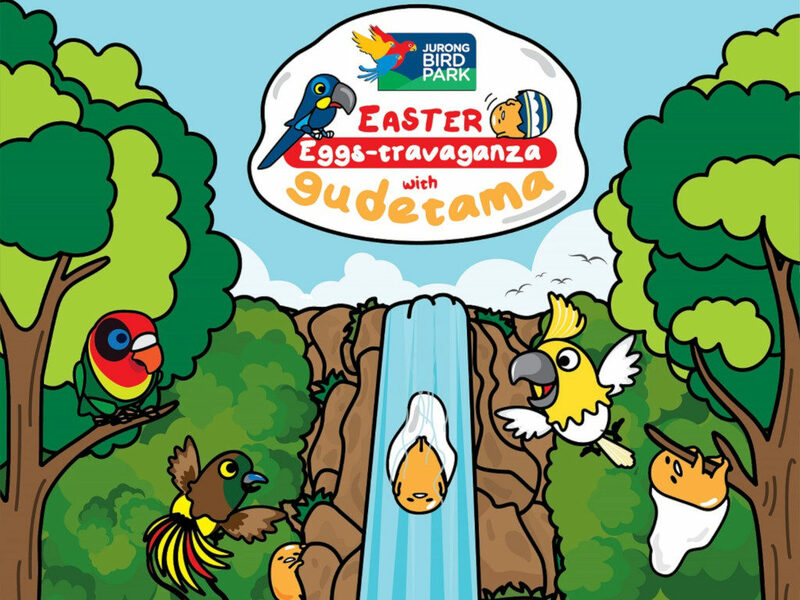 Then go hunting at the Waterfall aviary and walk away with exclusive collectibles when you find the golden egg. Kids can make Gudetama-themed crafts and go on a Learning Egg-venture Trail too. Little ones will enjoy making their own Easter confection at this enchanted workshop conducted by Chef Herve. 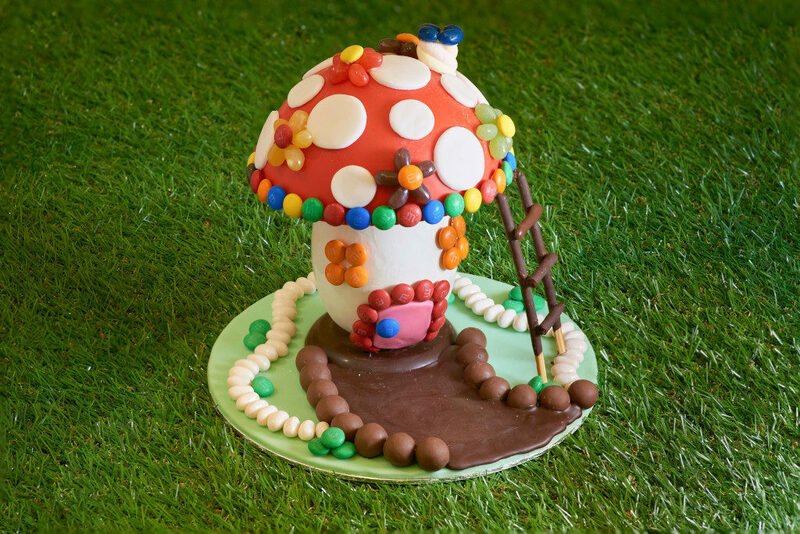 They’ll get to delve into a world of chocolate, colourful sprinkles and other edible ornaments. They can bring home their completed masterpiece, along with a mini chef’s toque and apron. While you’re at the Tower Wing Lobby, admire the spectacular chocolate masterpiece handmade by the pastry team! Learn more about cocoa, a widely loved ingredient that’s featured so much during Easter all over the world. 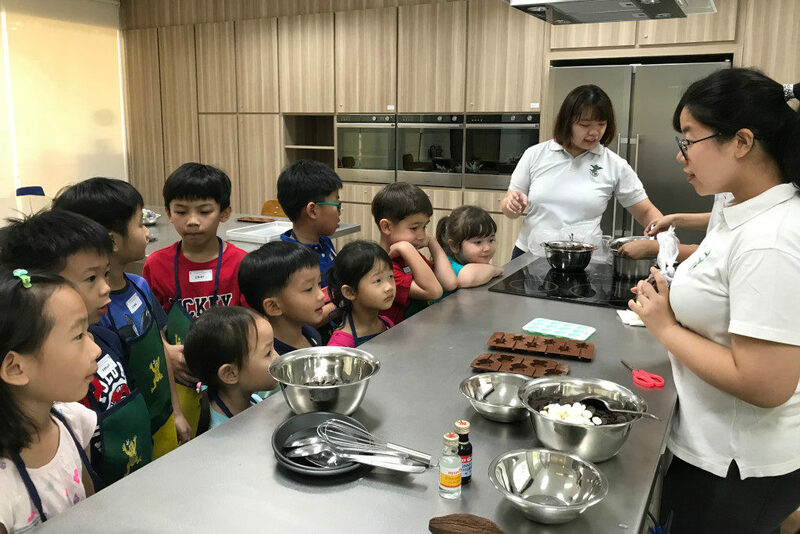 This culinary workshop for Kindergarten 1 to Secondary 2 kids will also see them whip it into a delicious treat! The programme includes a guided tour around the newly enhanced Jacob Ballas Children’s Garden. Registration (via the link below) closes 10 April, or when full. 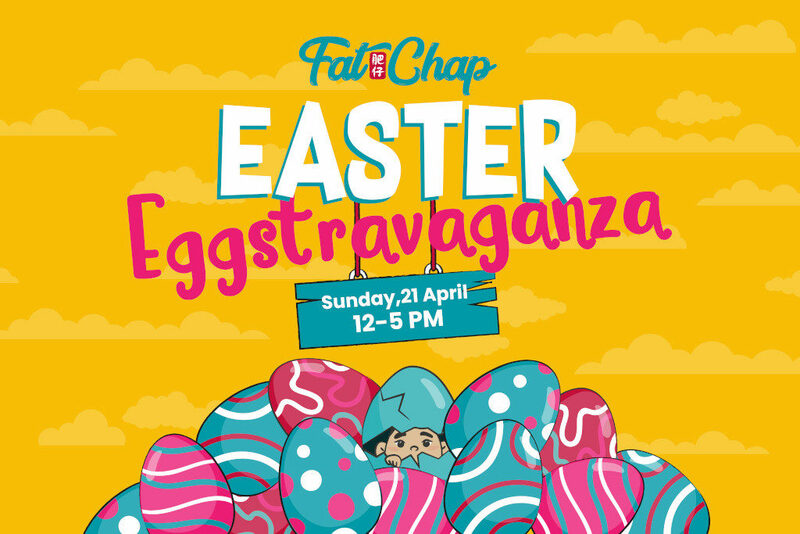 Gear up for Fat Chap’s first-ever Easter Eggstravaganza, an afternoon of workshops, games and food. Let Head Chef Selamat Susanto bring out the creative chef in your kids at Flatbread Making Workshops. 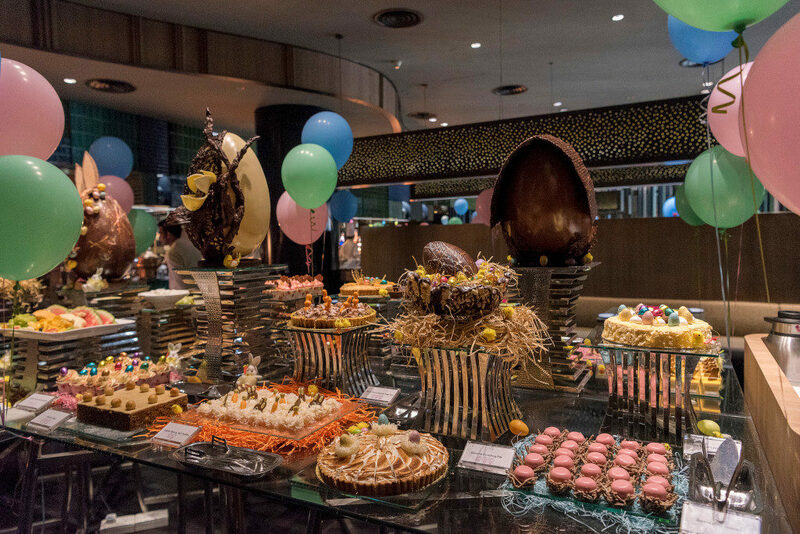 Then fill your tummies at the buffet line of Easter-themed delights inspired by Asian street food. Also look forward to egg painting and a mini Easter egg hunt, as well as cotton candy and popcorn stands. 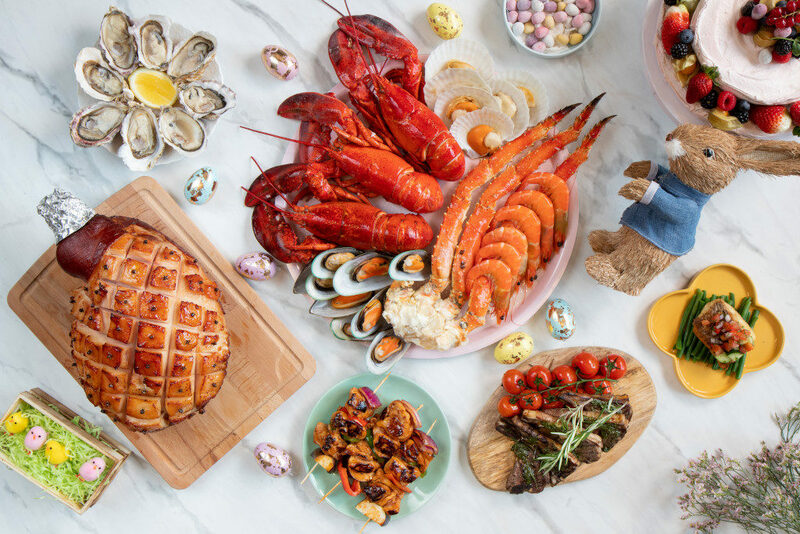 Eat As 15 Stamford by Alvin Leung celebrates its first Easter, eight live stations offer everything from chilled seafood to freshly prepared breakfasts. The showcase wood and charcoal fired grill features roasted whole lamb, grilled Tomahawk steak, and more. Chef Alvin’s signature Asian-influenced dishes sit alongside ‘Berthold & Frieda’ European classics. 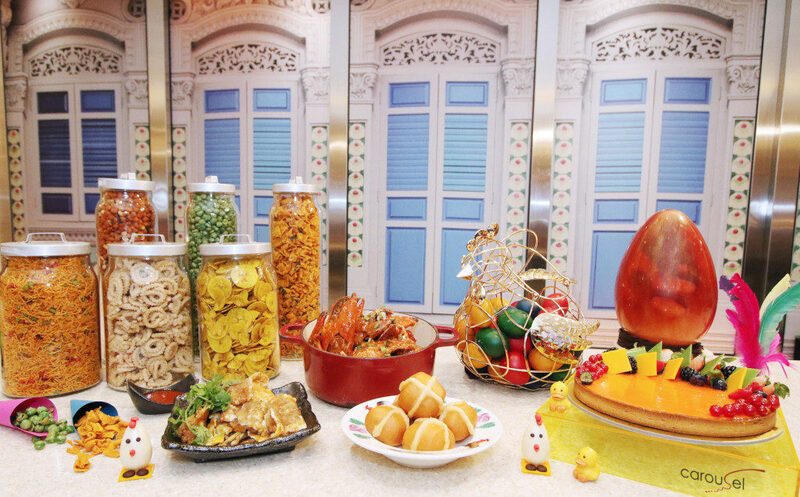 Desserts include Portuguese egg tarts, mango kueh lapis and Easter rice pudding. Play There’ll be a special reading of Little Godwit Finds His Wings by award-winning children’s books author Emily Lim-Leh. Kids can also look forward to the egg dance, egg-and-spoon race and more at The Capitol Kempinski Hotel’s arcade. They might run into the Easter bunny mascot while engaged in hunting for delicious Easter eggs too! Eat Indulge in a hearty selection of Easter favourites, including Beef Wellington, Eggs Benedict, Seafood Paella, Shakshuka, and Eggs Station. The carving station boasts Slow Cooked Beef Ribs and Stuffed Leg of Lamb. Local delicacies, DIY Healthy Bowl station, and sweet treats such as Classic Easter Carrot Cake and Cake Pops also feature. Play Bar ’75 across from Azur transforms into Kids Funland, inclusive of a dedicated kids mini buffet. Families can bond over the Egg Painting session and Egg Hunt, as the adorable Easter Bunny spreads holiday cheer. 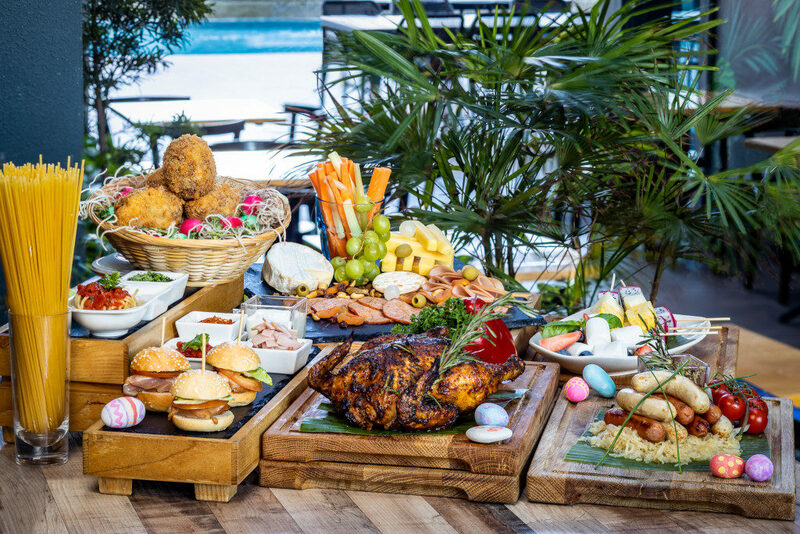 Eat The buffet spread combines refreshing Thai flavours and exclusive Easter creations, from Lemon Steamed Fish with Vegetables to generously sized Scottish Eggs. The kids get their own buffet section to attract even the fussiest eaters. A glorious three-tier Chocolate Fondue crowns the dessert spread. 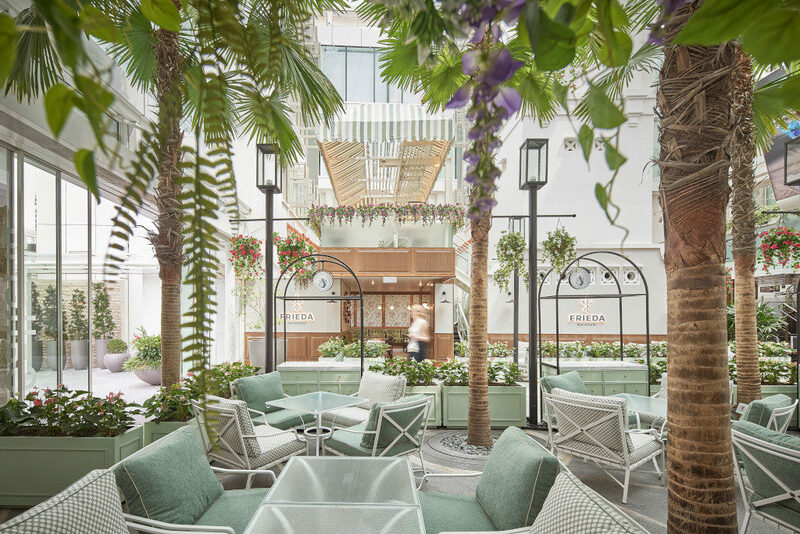 Play Go on adventure in the lush green surrounds of Park Hotel Farrer Park’s level 5 courtyard. The child who finds the most Easter eggs stands to win a buffet dinner for a family of four! Eat Throughout Easter weekend, a hearty Easter Feast is on the menu at Bread Street Kitchen. Tuck into six signature sharing plates serving Tamarind spiced chicken wings, Slow-roasted Dingley Dell pork belly, and more. End your meal on a sweet note with Swiss roll with creamy raspberry filling and raspberry sorbet. Play Kids can get creative at the Kids Fun Corner, where they get to decorate cookies and Easter Eggs. Eat Feast your way down memory lane with local heritage dishes, some with a festive twist. Singapore Chilli Crab with Hot Cross Mantou, anyone? Classic Easter specials such as Oven-roasted Whole Baby Lamb and Simnel Cake will also be served. Carousel will also bring back the kacang puteh cart so you can create your own paper cones of traditional snacks. Play In another local twist, this Easter hunt involves searching for local dishes hidden in the restaurant. Get it right and receive chocolates eggs from Mr Easter Bunny. Kids also get to pick a prize from the old-school tikam tikam board! Eat For one day only, the regular Dim Sum Brunch hops aside and a festive offering spreads across 16 stations. Enjoy popular brunch staples and a carvery with Slow Roasted Prime Rib, alongside Easter classics such as Torta Pasqualina, and Mini Hot Cross Buns. Alternatively, enjoy La Famille Brunch at La Brasserie, or A Three-tiered Easter Affair afternoon tea at The Landing Point. 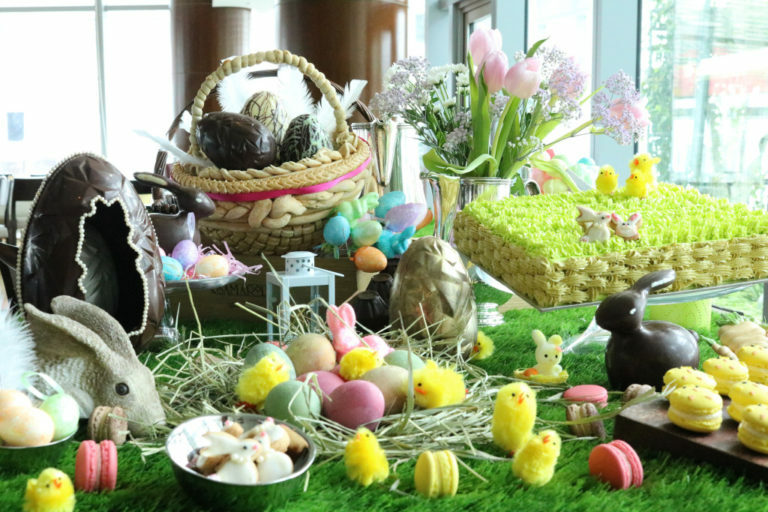 Play In keeping with tradition, The Floating Pods hosts The Fullerton Bay Hotel’s annual Easter Egg Hunt at 3pm. Prizes await some-bunny who finds the most eggs! More games, crafts and finger food will keep the kids happy at the dedicated Kids’ Room. 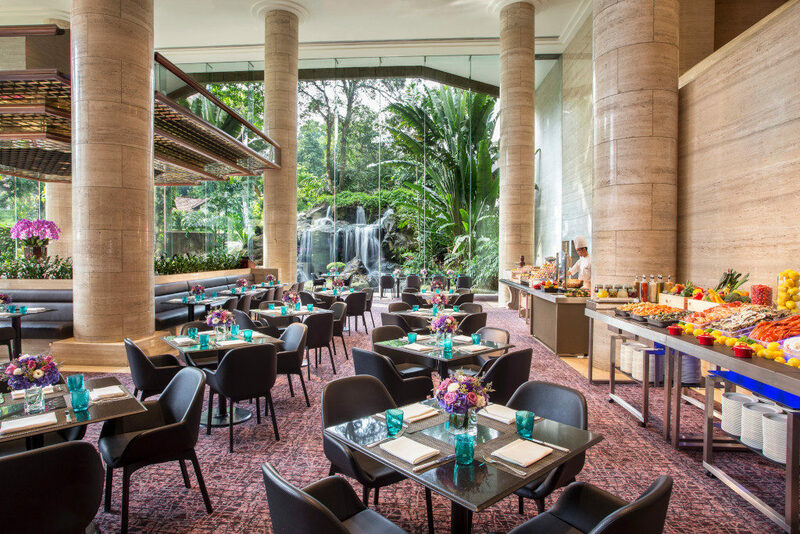 Eat Prepare for an epicurean Sunday lunch buffet set against the signature cascading waterfall at The Dining Room this Easter. Culinary highlights range from Wok-fried White Pepper Crab and Marmite Chicken to Scotch Egg and Onion-crusted Australian Prime Rib Roast. Hot Cross Bun Pudding, and Chocolate Nest with Five-spice Crumble sweeten the deal. Play Kids can decorate a chocolate cookie lollipop at the restaurant’s kids’ corner. 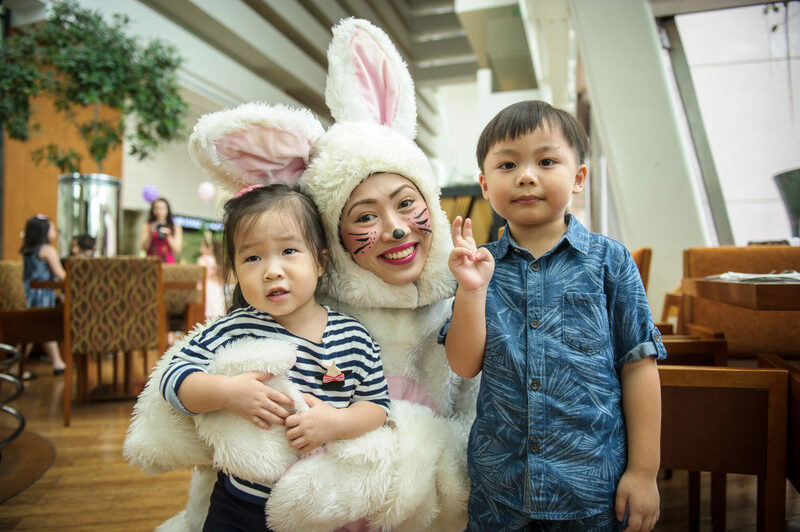 Or pop by the Kids Room at the Lower Lobby Level of Sheraton Towers Singapore for more kid-centric Easter entertainment. 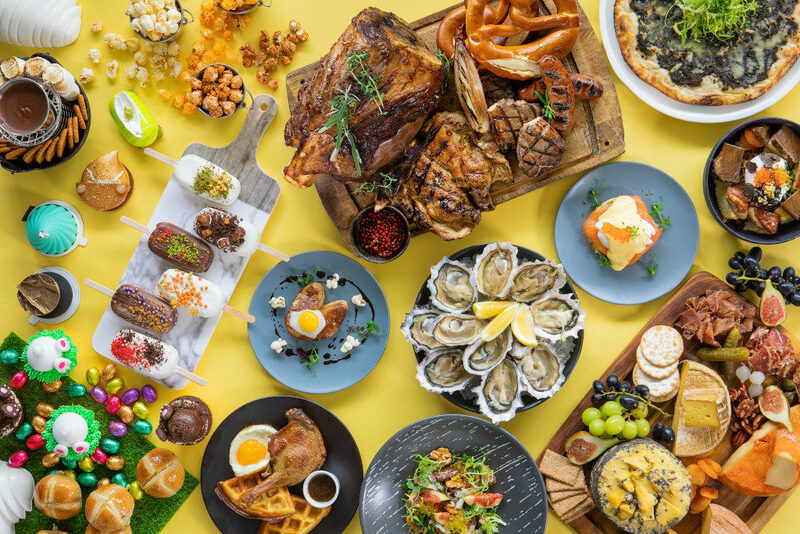 Eat The extensive Easter Sunday Champagne Brunch boasts the finest Seafood on Ice, Roasted Prime Tomahawk, Oven-roasted Porchetta and more. Tuck into Chef’s Special of Shellfish Seafood Risotto served tableside. For a sweet conclusion, a magnificent spread of Easter-themed desserts, including Hot Cross Buns, Colourful Easter Eggs and Banoffee Eclair. Play The little ones will be treated to an afternoon of interactive fun and entertainment. To complement the traditional egg hunt, skilled face and hand painters will delight them with creative designs. An Easter Bunny mascot will also be making its rounds with goodies and photography mementos. Eat Savour hearty flavours including Honey Glazed Bone-in Gammon Ham, Pineapple Fed Pot Roast Kampong Chicken, and Balsamic Glazed Roast Beef Short Rib with Celeriac Purée. The kids will love the dedicated kids buffet at the Children’s Corner. They’ll also delight in desserts such as the Bunny Carrot Cake, Easter Egg Hunt Cupcake and more. Play The little ones can also look forward to an afternoon of fun activities. These include cartoon screening, egg painting, balloon sculpting and Wii games! 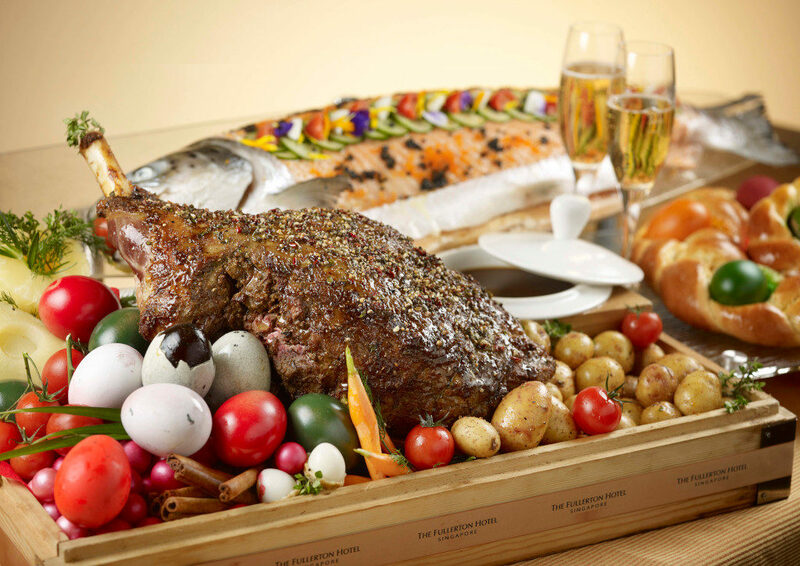 Eat Feast on a semi-buffet of traditional Easter delights such as Devilled Eggs and Green Asparagus with Virginia Ham. Pick your main course from a selection of German classics, such as Pretzel Dumplings or Smoked Beef Sausage. Round it off with desserts from Snow Egg with Crème Anglaise to Hot Cross Buns. Play Over at The Capitol Kempinski Hotel’s Arcade, follow the clues to find the missing Easter Eggs and save the day. Other exciting programmes include meeting the Easter Bunny, face painting and balloon sculpting. Eat The annual sell-out fiesta features an international lunch buffet with Easter-centric highlights, including a dedicated spread for the kids. Enjoy Classic Salmon Deviled Eggs, Pan-roasted Saltbush Leg of Lamb with Mint Chimichurri, and Whole Roasted Turkey. Enticing sweets include Warm Chocolate Bread Pudding with Vanilla Sauce, adorable Easter Bunny Cakes and Baby Bunny Cookies. Play Little ones who come to the fiesta dressed in their most adorable animal costume stand to win prizes in the “Friends of the Forest” Best Dressed Contest. Expect cookie decoration and Easter Bunny mask-making workshops, bouncy castle, kids’ play zone movie screenings and a roving Easter Bunny. 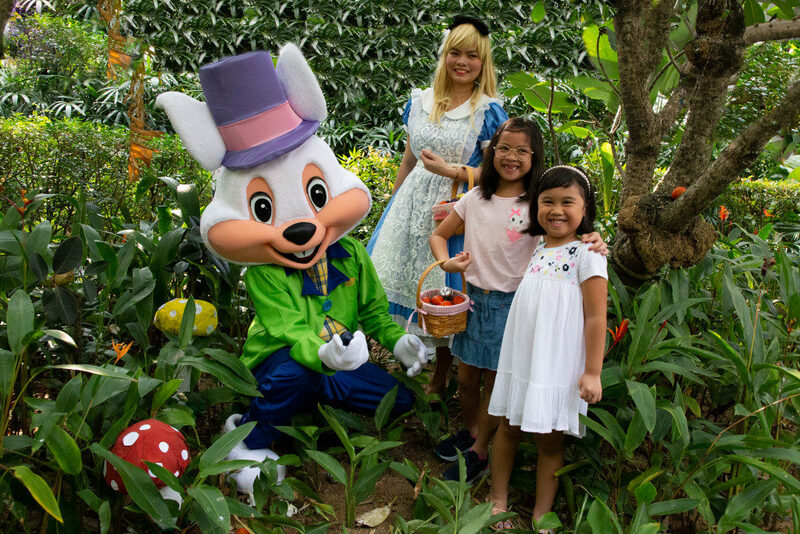 A jungle-themed Easter Egg Hunt at the Garden Terrace completes the afternoon’s activities. Eat The top-notch spread at the kitchen table includes a caviar bar, raw bar, cheese bar and foie gras station. Paella Valenciana, BBQ pulled beef egg benedict, Baked Scallops A la Catalana, and Seafood Gnocchetti will leave you wanting more. Carving stations boast Wagyu Mayura Leg and Whole Roasted Halibut, while the enticing-sounding chocolate island awaits! Play There will also be exciting activities sure to keep the kids busy. You even enjoy complimentary access to WET®, complete with the new W slide for more fun in the sun! 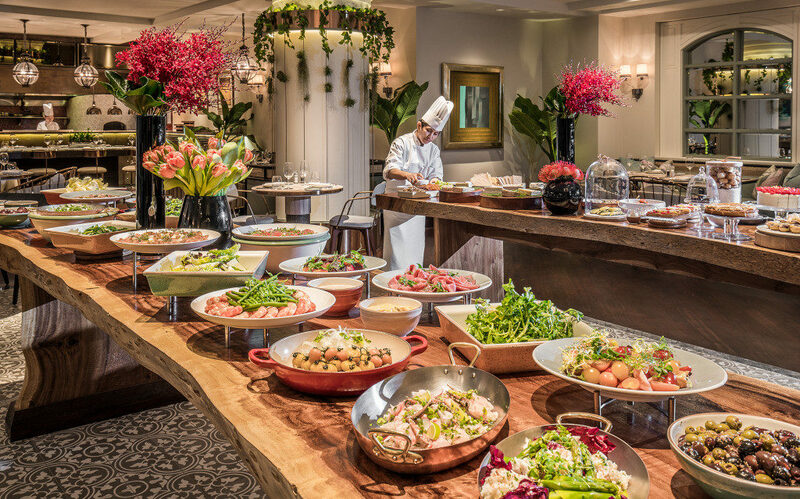 Eat This sumptuous brunch buffet consists of cold and hot stations. Delicious mains include Roasted Chicken Fricassee, Braised Beef Cheek, and a live carving of Lamb Shoulder. The dessert spread boasts the adorable Chocolate Bunnies, Tiramisu, Passionfruit Mousse with Peach, and more. 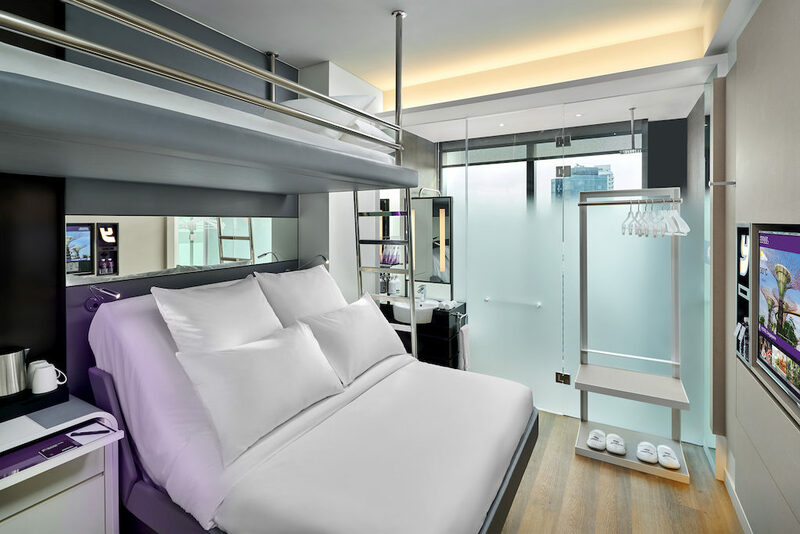 Play Indulge in an Easter weekend at YOTEL Singapore. Events range from an Easter Egg Hunt and Easter Bunny Meet-and-Greet, to Easter Sunday Market and even movie screenings. There’s even a popcorn station to seal the deal! Eat Sip on the Blue Island, a refreshing welcome drink. Enjoy special delights from leg of lamb with lemon and olives, to Wagyu beef, roasted chicken with herbs and more. Local delights like Singapore laksa and black pepper char kway teow make their appearance too. 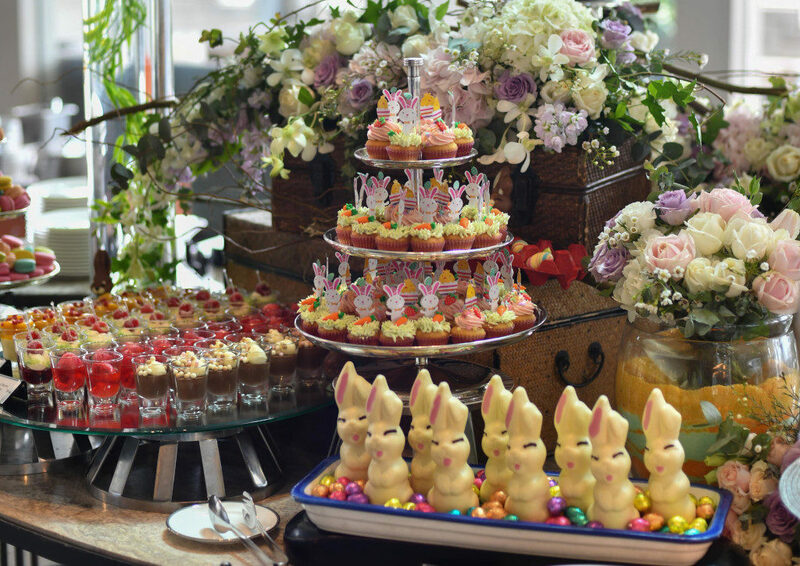 The dessert table boasts Easter bunny cake, Easter dirt brownie, rainbow-hued terrines, candy floss and more. Play From egg-painting fun to balloon-twisting sessions, there’ll be plenty to keep the kids busy too. Eat Savour an Italian Easter brunch featuring special items such as Devilled Eggs, on top of the regular brunch menu. 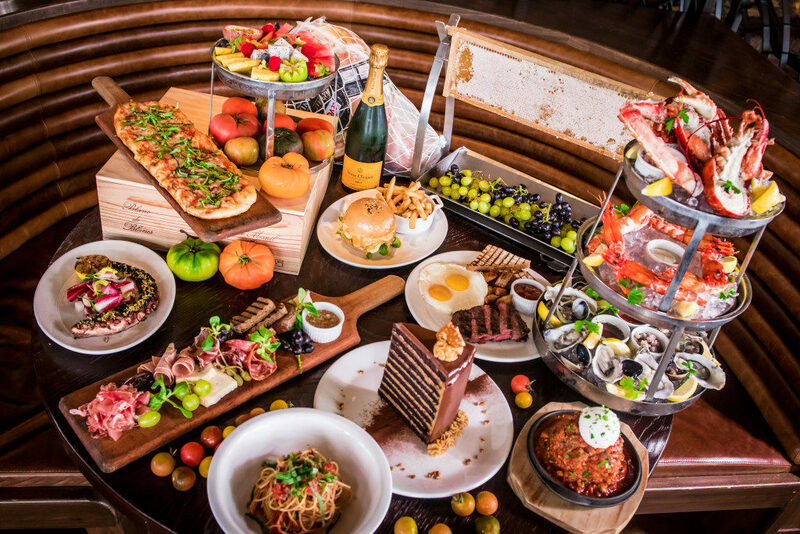 Culinary treats include fresh seafood, canapes, and LAVO’s breakfast hits including mixed wild mushroom frittata, apple wood smoked bacon, and its signature meatballs made from imperial wagyu and Italian sausage. Play A party for all-ages, there’ll be fun-filled activities for children, such as face painting and an Easter egg hunt. 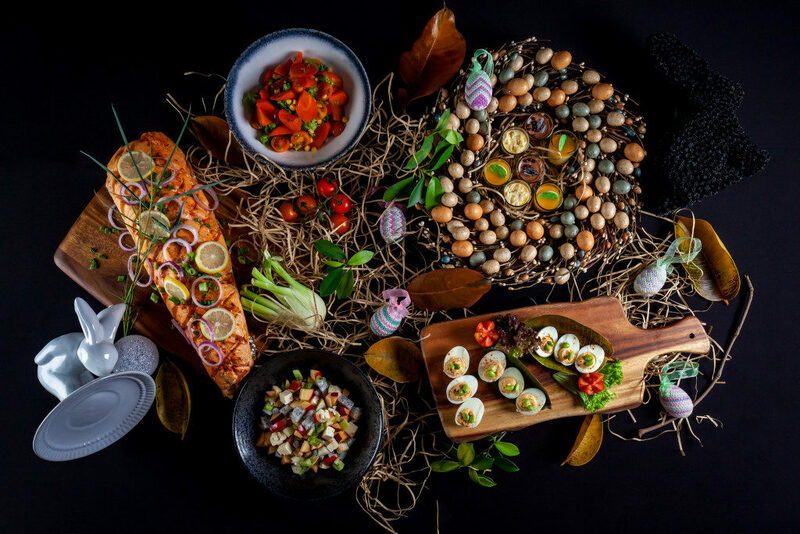 Eat Go on an enchanted gourmet journey at The Line this Easter, with its extensive international buffet spread. It includes speciality dishes, such as Scallop Gratin with Truffle Hollandaise, and Pan-seared Foie Gras with Kumquat Compote. 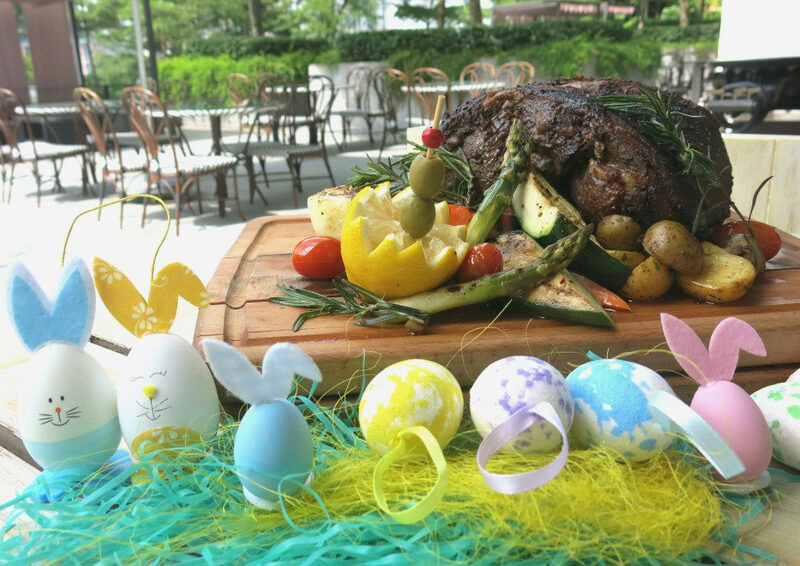 Alternatively, enjoy Origin Grill’s semi-buffet Easter Brunch or a traditional Italian Easter brunch buffet at Waterfall Ristorante Italiano. Easter high-tea buffet is also available at Rose Veranda. Play Kids can hop into a magical adventure at the Shangri-La Hotel, Singapore. A host of fun activities include a balloonist performance and an Easter egg hunt. And don’t miss the Enchanted Chocolate Garden Show (20 April, 6.30pm & 21 April, 11.45am), a live performance by Dwayne Lau and children from Luminous Dance Academy. 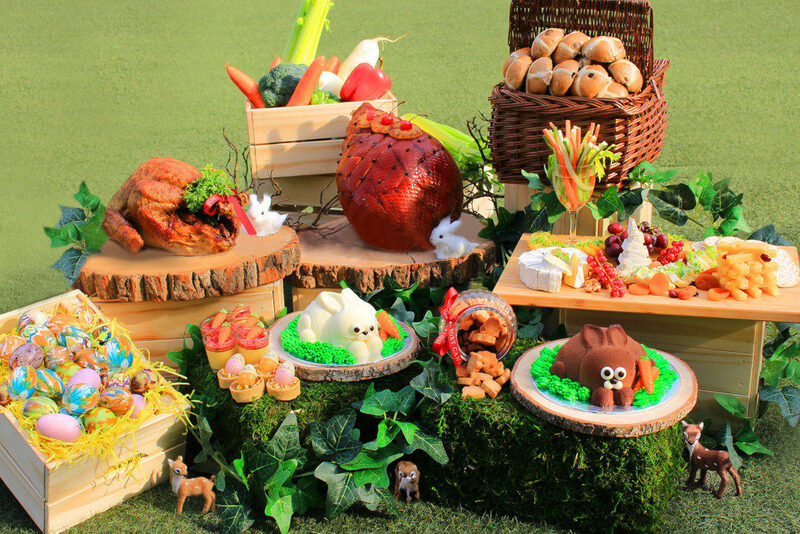 Eat Enjoy an Easter-themed buffet brunch at The Marmalade Pantry Novena. The spread includes signatures such as the Marmalade Mac & Cheese, Spicy Crabmeat Pasta, Pancakes, Truffle Fries and more. There’ll also be an extensive dessert table to drool over. Play Fun-filled activities for children include balloon sculpting, face painting and a magic show. Every family of four (2 adults and 2 children) will also receive a complimentary Skyline Luge Sentosa Family Pass when paying with Mastercard. 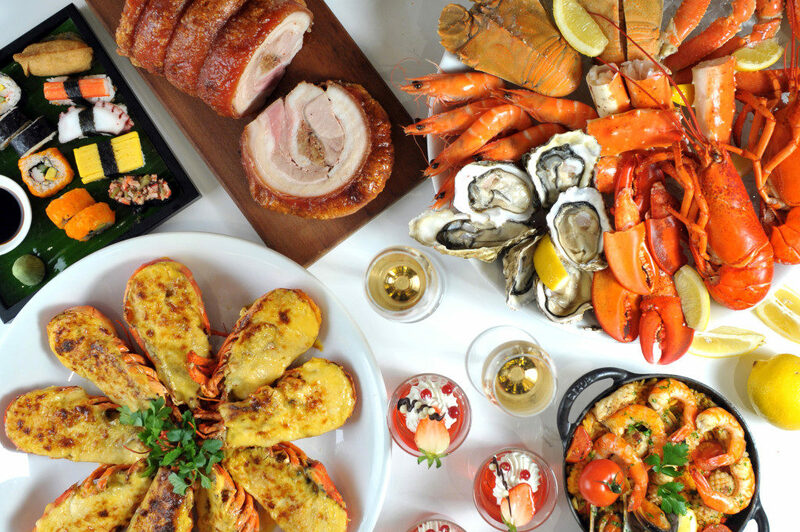 Eat Celebrate springtime with an opulent spread of oceanic delights fresh, cured or grilled to perfection. Live stations will be serving up delicacies from Seared Duck Foie Gras to Crispy Pork Saddle, and Leg of Lamb. Leave room for some hearty Asian fare and of course, the extended dessert station of Easter specials. There’ll be the Giant Chocolate Egg Tiramisu and Orange Chocolate Fountain, just for starters! Play The little ones will also have a blast with a host of kid-friendly activities. Eat Begin your fairytale feast with fresh salads and seafood, before hitting the popular Japanese and Indian stations. 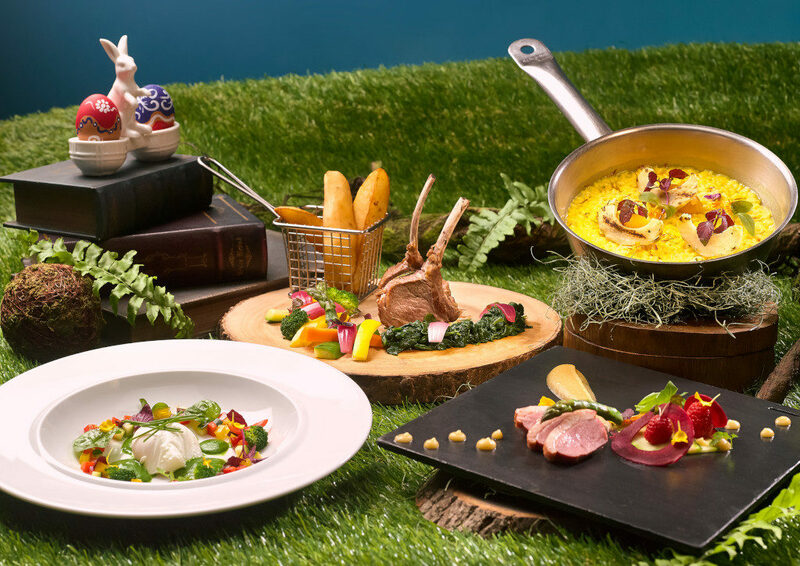 At the outdoor garden, find Wagyu Beef Tomahawk Steak and other succulent meats, while Chilli Crab, Scotch Quail Eggs and more await at Chessboard Battlefield. Finally, indulge in desserts from Yuzu Strawberry Mousse to Chocolate Pudding with Azuki red beans. Play Meet Alice and friends as you have fun face painting and egg painting. Then participate in The Golden Egg Hunt as a family. Three lucky diners walk away with either a luxurious one-night stay or dining vouchers from Mandarin Oriental Singapore. Eat As always, expect a unique Easter at Mitzo. Savour over 50 types of dim sum, soups, roasts, wok dishes and desserts, specially curated by Executive Chef Nicky Ng. Don’t miss the Easter-exclusive, the crispy Deep-fried Beef Cutlet with creamy sesame mayonnaise. Each diner also enjoys a complimentary serving of Supreme Special Dishes such as Stir-fried Abalone or Cheese Baked Lobster. Signature desserts from Hokkaido Milk Cheese Tart to Deep-fried Chocolate Liqueur Dumpling will please those with a sweet tooth. 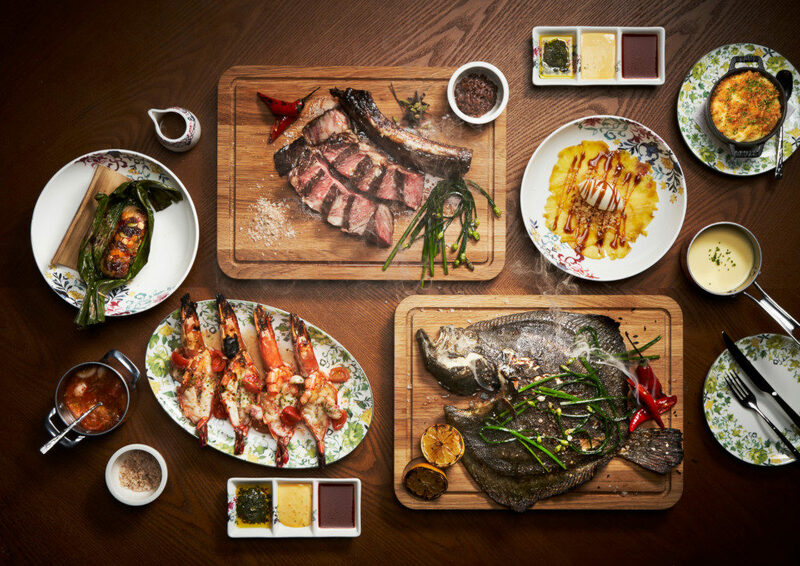 Eat Gather for a hearty brunch at the latest islander-inspired restaurant on Sentosa. 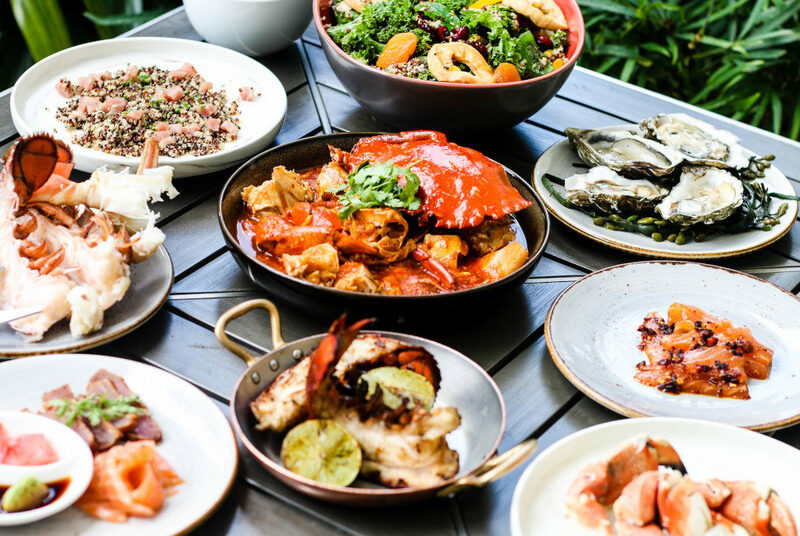 Enjoy a communal-style four-course semi-buffet of three sharing salads, a seafood platter, a BBQ board, and side dishes. It’s complemented by a delightful dessert table boasting a six-tier chocolate fountain. The kids get their own special buffet spread too. Play Little ones can also enjoy hunting for Easter eggs, a Bouncy Castle, balloon sculpting, face painting, movie screenings and more. Every child will also receive an exclusive Bunny soft toy. Families of two adults and one child receive a complimentary Skyline Luge Sentosa Family Pass when paying with Mastercard. Eat Whet your appetite with a selection of surf and turf specialities at The Oakwood Executive Club. Then watch the chefs grill up tiger prawns, minute steaks and salmon fillets at the outdoor barbecue pit. Crispy Chicken Drumlets with Truffle Maple Drizzle, and Blue Crab Bisque with Cognac Cream also star in the lineup. The plethora of desserts includes Mango and Yuzu Mousse Rabbit Cake, and Dark Chocolate Raspberry Cake with Peanut Butter Crunch. Eat Dive into a Premium Seafood Tower served to the table, on top of the overflowing buffet spread on offer. 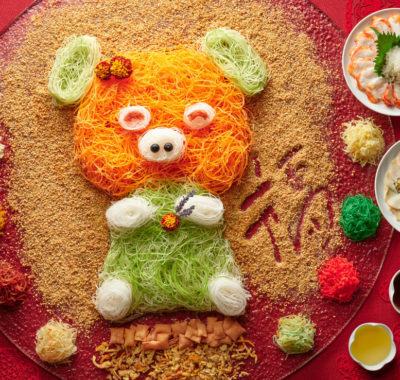 Must-try carvings include the elaborate Whole Roasted Lamb Kozy with Rice Stuffing, alongside Apple Wood Smoked Peking Duck and Slow Cooked Ocean Trout. Sweets include handcrafted character Chocolate eggs, Strawberry-Lime cake and Ricotta Cheese Tart. Play Completing the festivities are face-painting, bouncy castles at the Kids Playzone, and an Egg Hunt with prizes to be won. 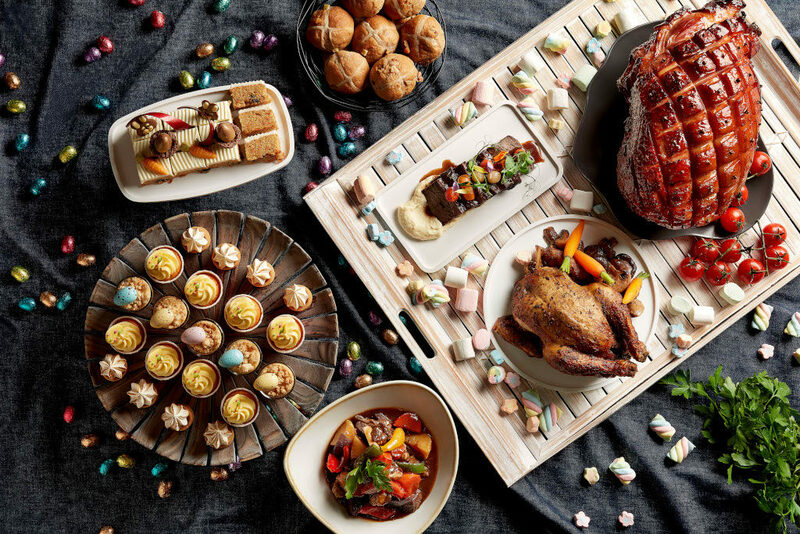 Eat This magnificent Easter feast boasts hearty carvings such as slow-roasted Australian Wagyu beef leg and flame-grilled butterflied chicken. Eight live stations also serve up gourmet specialties from foie gras brûlée to eggs benedict with smoked salmon and caviar. An Easter-inspired dessert collection and grilled s’mores bar adds to the already extensive D9 Cakery dessert showcase. Play Kids can indulge in a host of fun activities, not to mention designing their own Gelato Popsicles! Eat Wake up to Easter Sunday with a curated buffet spread fit for the occasion. The live carving station showcases succulent meats from Herb-crusted Lamb Leg to Baked Whole Soya-Sesame Salmon, while hot mains include Guinness Braised Beef Cheek, Cheesy Potato and Pork Scotch Eggs. Conclude the feast with Easter Rice Cake, Baked Apple Tarte Tatin and the Chocolate Fountain. Play From 12 noon to 2pm, the kids can expect a host of interactive entertainment. Go bunny hopping in the Bouncy Castle, enjoy a balloon sculpting show, and enjoy a variety of delicious treats. 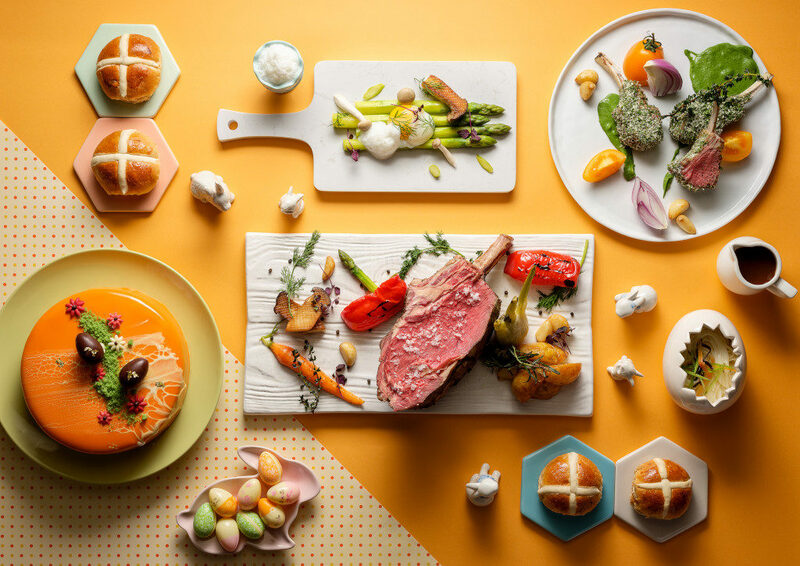 Eat Bond over a hearty Easter semi-buffet brunch at Porta. Accompanying your choice of main course from the all-new brunch menu are unlimited sides, appetisers, salads and desserts. A live carving station also offers tender Whole Roasted Salmon with Lemon Dill Sauce and Béarnaise. Over at the dessert table, a chocolate fountain towers over the delectable array of Easter sweets. Children below five years enjoy a complimentary Kids’ Dish of the Day. Play A kids’ playroom decked out in rocking horses and a vibrant caterpillar tunnel will entertain the little ones. 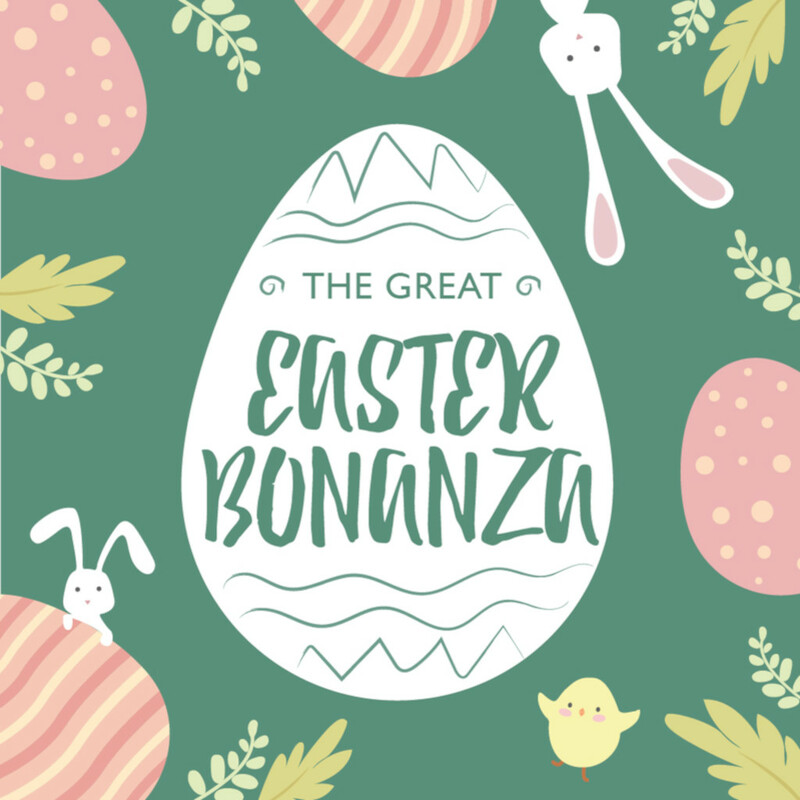 Besides family-friendly activities such as Easter egg painting and Easter Bunny mask making, there’s also an Easter Lucky Dip! Eat A decadent spread awaits, beginning with a specially curated ensemble of Easter carvery. 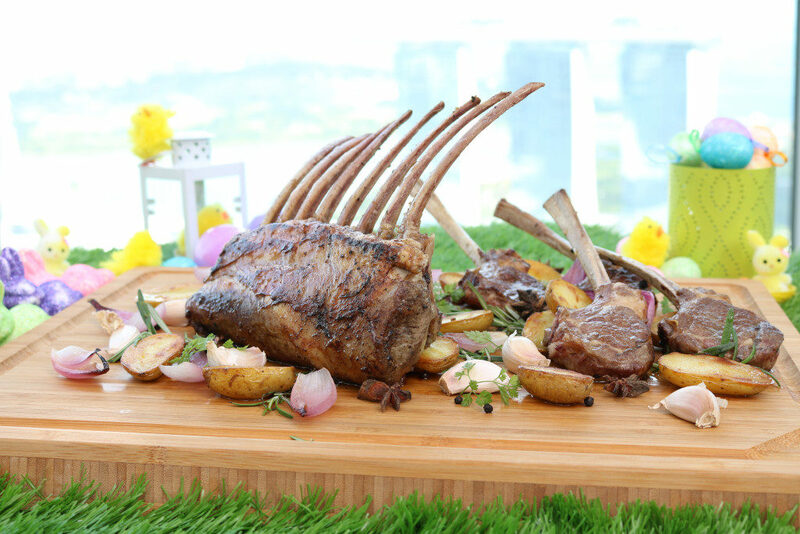 It features roasted lamb with sweet caramelised onions, and Black Angus beef tomahawks. Other highlights include sautéed Atlantic Saint Jacques scallops, deep-fried Barramundi, char-grilled rock lobster and more. Look forward to Executive Pastry Chef Sam Leong’s Easter chocolate egg station, Grand Marnier French Crêpes Suzette and other desserts. Play Kids will be entertained at the dedicated Kids’ Activity Lounge with its own selection of child-friendly cuisine. The Easter Bunny will also be making an appearance, leading diners on an exciting egg hunt. 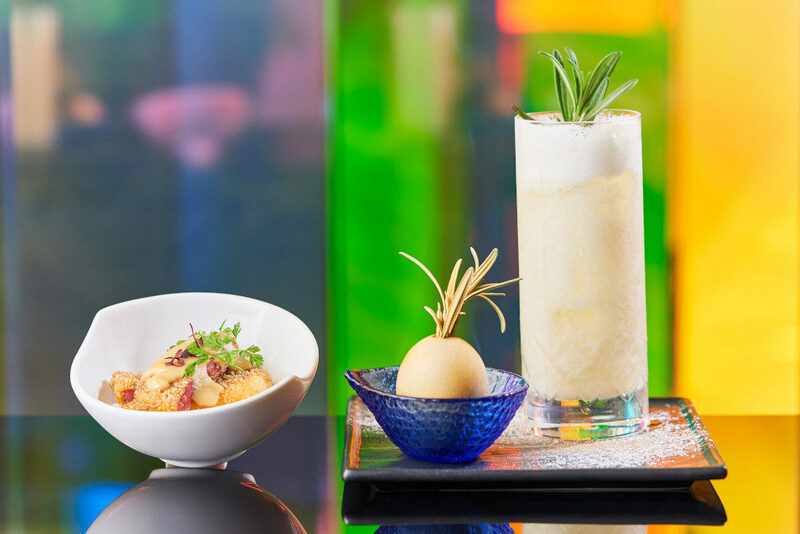 From now till 20 April, diners who decorate Easter Eggs at Racines stand a chance to win stays at Sofitel Singapore City Centre, plus 10% off adult Easter Brunch packages and complimentary packages for their kids. Eat In addition to the signature buffet spread, enjoy dishes such as Soft poached eggs topped with truffle potato foam, and Whole roasted Black Angus Tomahawk served with classic Yorkshire pudding and gravy. Complete the feast with Easter specials such as Baked apple pudding with cinnamon custard sauce. Play Take part in an Easter egg hunt at RISE’s Herb Garden, and get photos with the adorable bunny mascot. Kids aged 12 years and below will also receive a free ticket to the Digital Light Canvas, a one-of-a-kind digital playground located at The Shoppes at Marina Bay Sands. 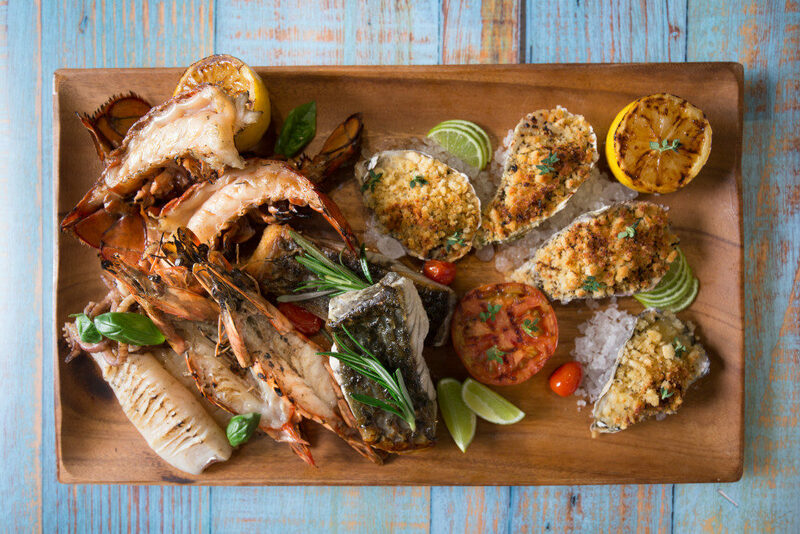 Eat Tuck into a delectable spread of international and seafood specials. 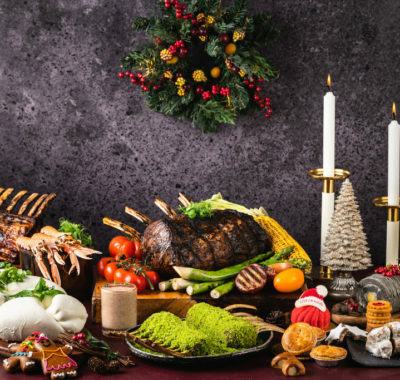 Festive highlights include Grilled Lamb Chops, Pan-seared Seabass, BBQ Chicken Kebabs, Berries Pavlova, Rocky Road and other sweet and savoury treats. Asian delights from Penang Char Kuey Teow to Singapore Laksa are on the menu too. Play The little ones can participate in an Easter Egg Hunt and other supervised activities at the children’s corner. They stand to win attractive prizes too! Eat Bottomless brunch favourites, fresh seafood, 24-hour Slow-roasted U.S. Wagyu Beef Leg with Yorkshire Pudding and more await. End the feasting on a sweet high with a spread of 27 desserts. Alternatively, enjoy “Buona Pasqua’ Semi-buffet Lunch at The Lighthouse Restaurant, or Easter Afternoon Tea at The Courtyard. 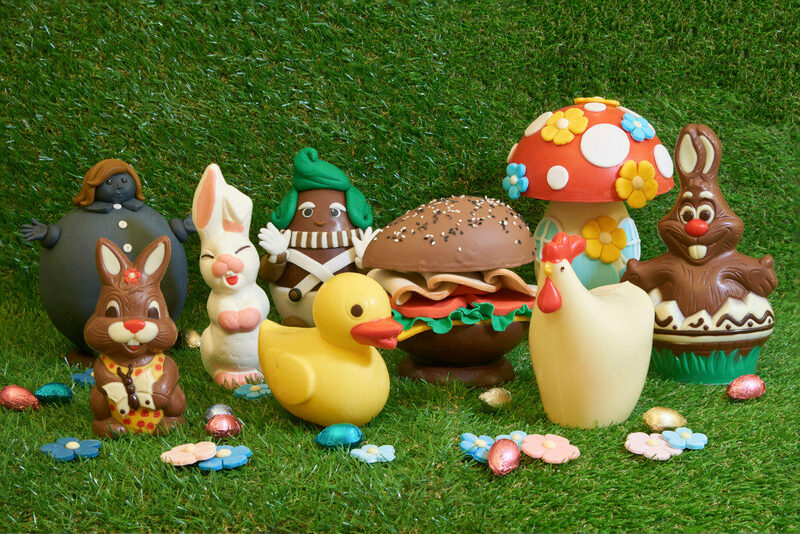 There’s even an Eggs & Bunnies Chocolate Buffet (19-20 April, 8pm-11pm) for those wanting to cut straight to dessert. 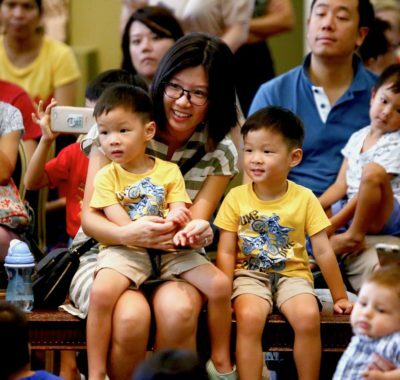 Play As always, The Fullerton Hotel’s annual Easter Egg Hunt commences at 1.30pm at East Garden. Little ones who collect the most eggs capture prizes too. More fun happenings in the Kids’ Room include Easter Egg Decorating and Balloon Sculpting. 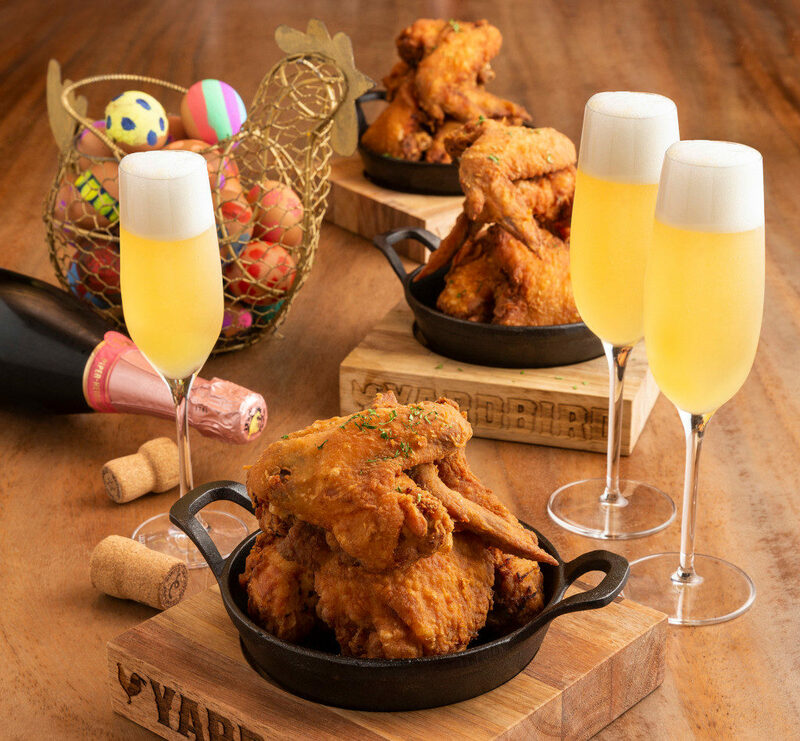 Eat Feast on Lewellyn’s Fine Fried Chicken as Yardbird brings back its popular “All-You-Can-Eat” fried chicken special this Easter. Top up $30++ to complement the meal with free-flow glasses of refreshing Mimosa. Families can also pick from Yardbird’s signature Great American Brunch menu. Kid-friendly highlights include Chicken & Egg Biscuit Sandwich, Funfetti Pancakes and Doughnut Tree. Play Children can also enjoy brunch in the company of an adorable Easter Bunny. He’ll be making his rounds with baskets full of chocolates and sweet treats! Eat Melding Italian traditions and seasonal flavours, Head Chef Emanuele Faggi presents festive fare served sharing-style at the table. 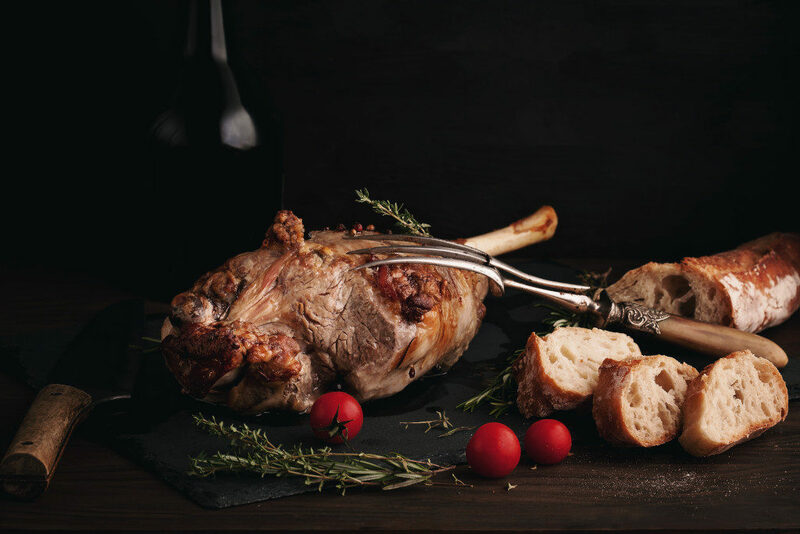 Enjoy Italian Easter classics from Torta Pasqualina to the Tuscan Easter dish of Roasted Lamb at the carving station. 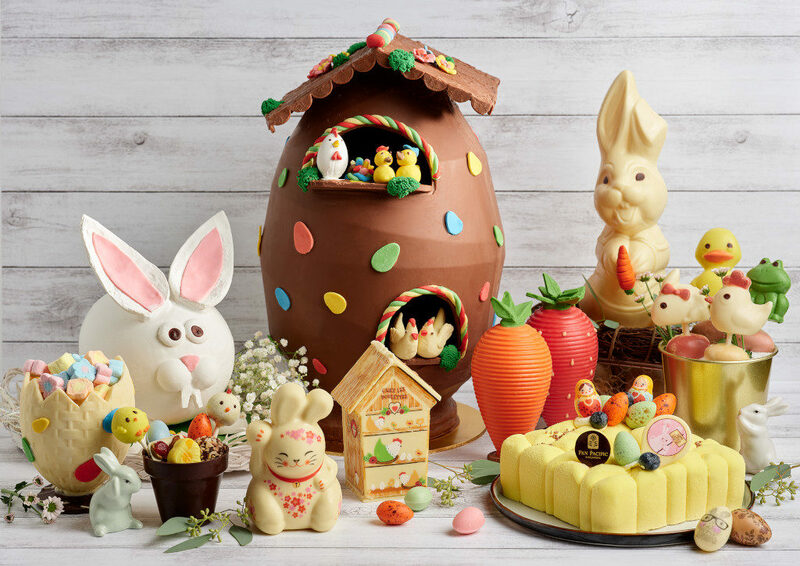 Revel in traditional Easter desserts, from the dove-shaped Colomba butter cake to handcrafted chocolate eggs and a gelato trolley. Play At brunch, children can also enjoy Easter Egg painting using chocolate sauce and colourful nonpareil sprinkles. Cedele’s ever-popular range of Hot Cross Buns returns this Easter. Hopping in too is the new savoury Pesto Cheese Walnut Hot Cross Bun. You can even enjoy it in the form of Smoked Salmon Avocado, and Smoked Ham & Egg Hot Cross Sliders! They’re joined by four adorable cupcakes and a new limited-edition vegan Chocolate Strawberry Chia Cake. Available for dine-in and takeaway from 6 to 22 April 2019 at Cedele outlets. 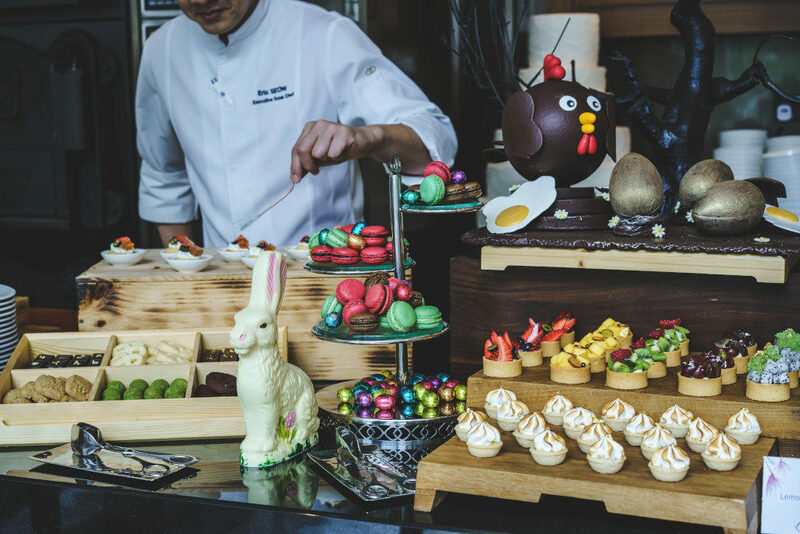 Surprise your Easter guests with Instagram-worthy delights handcrafted by Hilton Singapore’s Executive Pastry Chef Cindy Khoo. 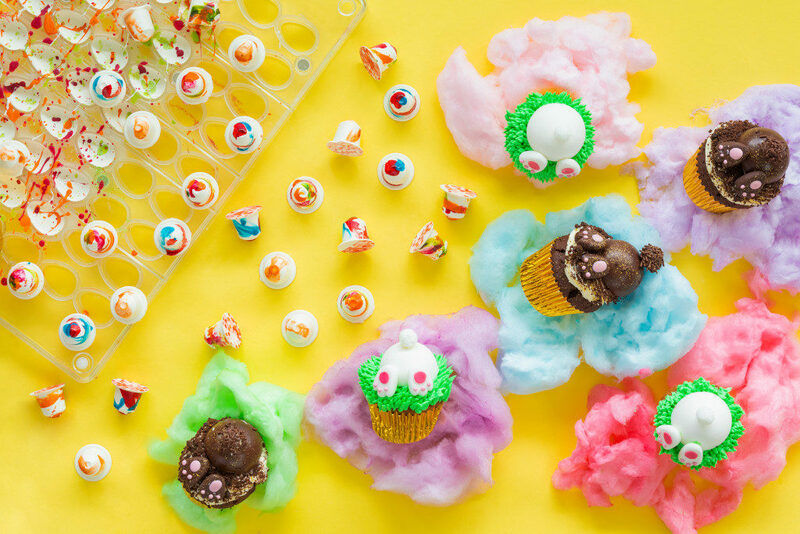 These include whimsical cotton candy and fudgy brownie bunny tail cupcakes, and popping candy, hot cross buns and pumpkin spice Easter pralines. Available from 15 to 21 April 2019 at D9 Cakery, Lobby Level, Hilton Singapore. 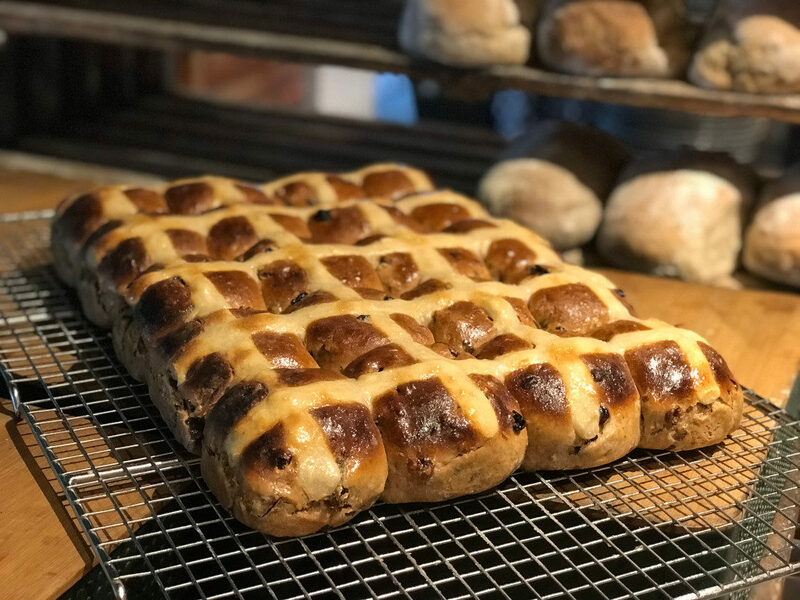 A special bake only available during the Easter season, Firebake’s Hot Cross Buns makes its long-awaited return this month. Its woodfired sourdough version is enriched with citrus peel and organic dried fruit also used in its popular Valley loaves. Available from 2 to 28 April 2019 at Firebake, 237 East Coast Road. Guaranteed hits for kids are adorable Easter goodies from Maneki Rabbit and Tchin Tchin Matryoshka to Mr and Mrs Teddy. Other tasty highlights include the Cranberry Cream Cheese Hot Cross Bun and Mango Passion Gateau. Gourmet roasts, salads and soups are also available as Easter Bundles or a la carte. Available till 21 April 2019 online or at Pacific Marketplace, Level 1, Pan Pacific Singapore. 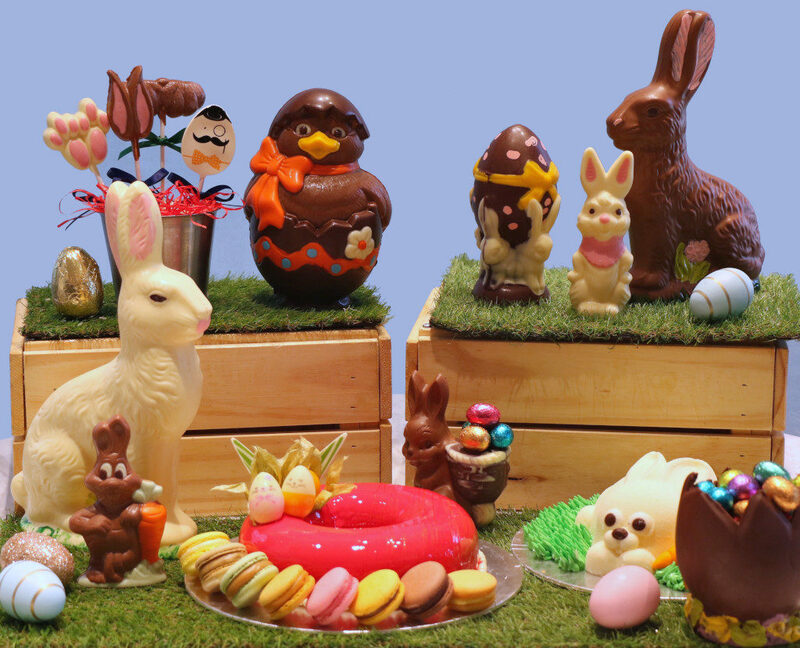 Discover an array of Easter goodies handcrafted by Area Executive Pastry Chef Herve Potus. Highlights include three special characters – The Dwarf, Blueberry Girl and Fantasy Mushroom. Every purchase gives you a chance to win prizes, including a one-night stay at Shangri-La Hotel, Singapore’s Tower Wing Deluxe Room! Available for pre-order online from 15 March to 21 April 2019, and from 1 April at Shophouse by Shangri-La, Tower Wing Lobby, Shangri-La Hotel, Singapore. 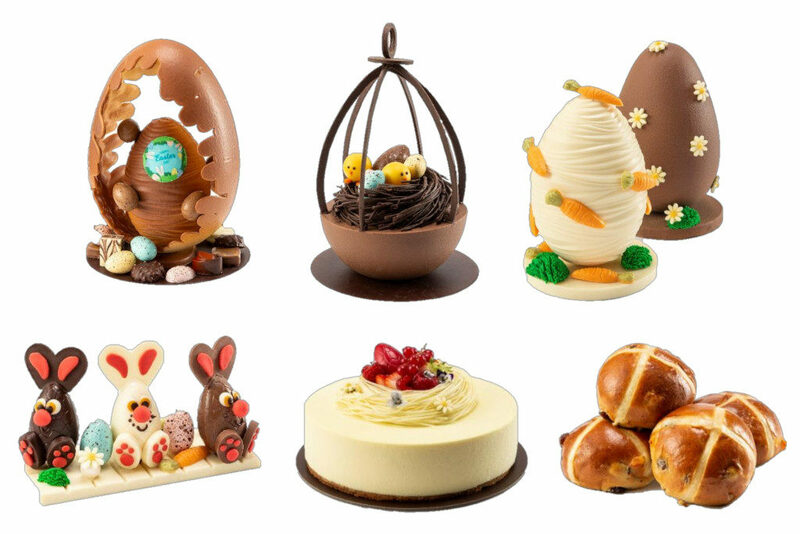 Relish in whimsical themed treats including a medley of Chocolate Easter Eggs and a trio of Chocolate Easter Bunnies. Other highlights include The White Chocolate Red Fruit Mousse Cake, Dark Chocolate Orange Pound Cake, and Hot Cross Bun. Available till 21 April 2019 at SweetSpot, Hotel Tower 3 Lobby, Marina Bay Sands. 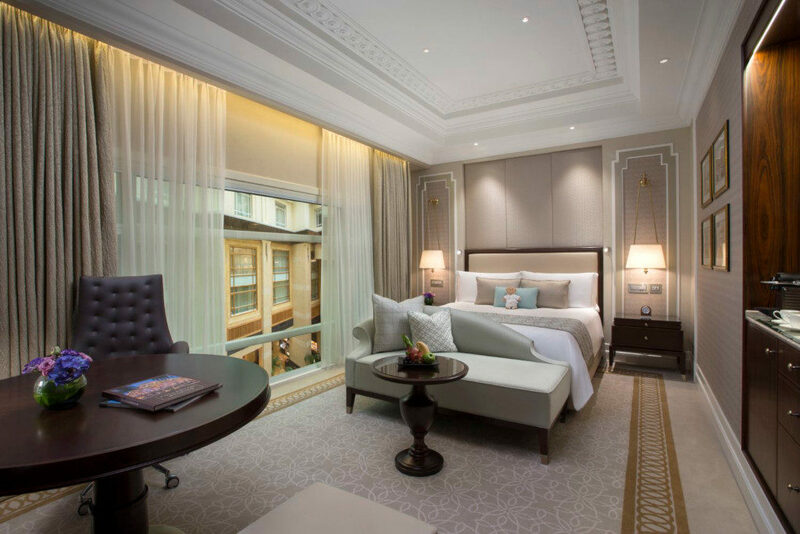 Two kids below 12 years stay for free when you book an Easter Room Package at The Fullerton Hotel. Enjoy up to 15% off Best Available Rates starting from Premier Courtyard Room. Two adults and two kids also enjoy daily international buffet breakfast in Town Restaurant, plus complimentary Easter chocolates upon check-in. Available till 28 April 2019. For reservations or enquiries, call 6533 8388 or email reservations@fullertonhotels.com. 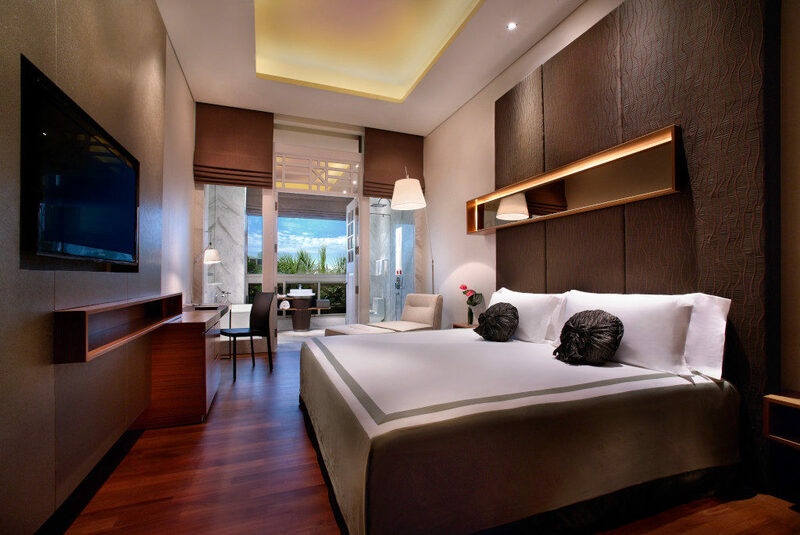 Book an Easter Room Package at The Fullerton Bay Hotel and get up to 15% off Best Available Rates. Starting from the Deluxe Room, two kids below 12 years enjoy a complimentary stay, with welcome Easter chocolates to boot. Daily international buffet breakfast in La Brasserie for up to two adults and two kids is included. Available till 28 April 2019. For reservations or enquiries, call 6333 8388 or email fbh.info@fullertonhotels.com. 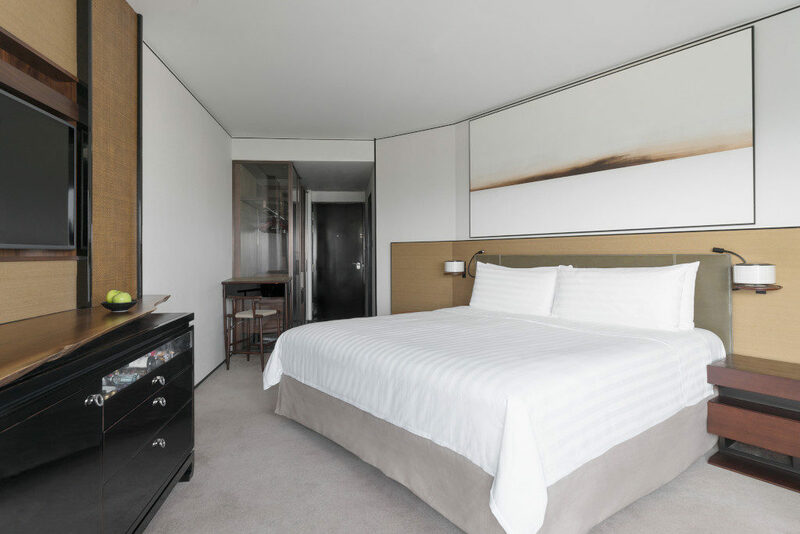 Perfect the long weekend with an Easter Weekend Wind-down package at Hotel Fort Canning. It includes 15% savings on “Easter in the Park: Friends of the Forest”. This is on top of daily breakfast buffet for two at The Salon, Aperitif Hour and other package privileges. Available from 19 to 21 April 2019. For reservations or enquiries, call 6559 6769 or email reservations@hfcsingapore.com. This Easter room package lets you immerse in all the enchanted happenings at Shangri-La Hotel, Singapore. Book by 10 April to receive $50 worth of enchanted Easter goodies and $100 dining credit when you stay a minimum of two nights. 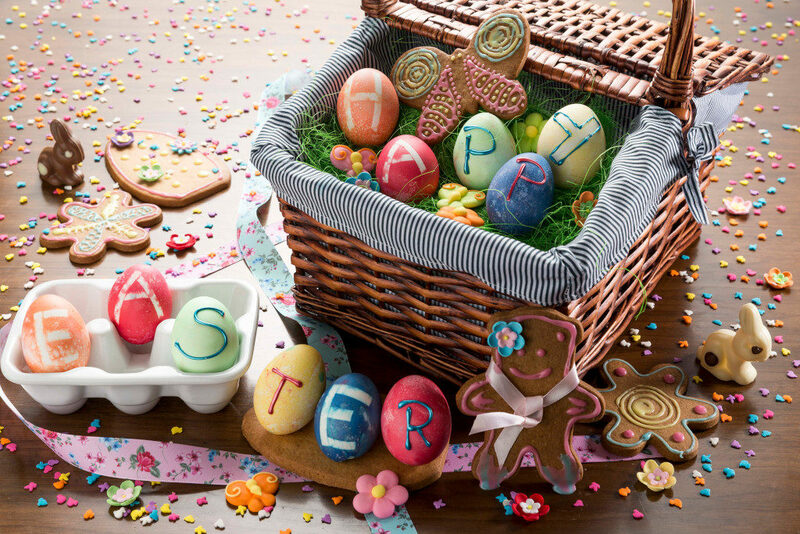 From 19 to 21 April, the little ones can participate in Easter fun at Buds by Shangri-La too! Available from 15 to 25 April 2019. For reservations or enquiries, call 6213 4002 or email reservation.sls@shangri-la.com. 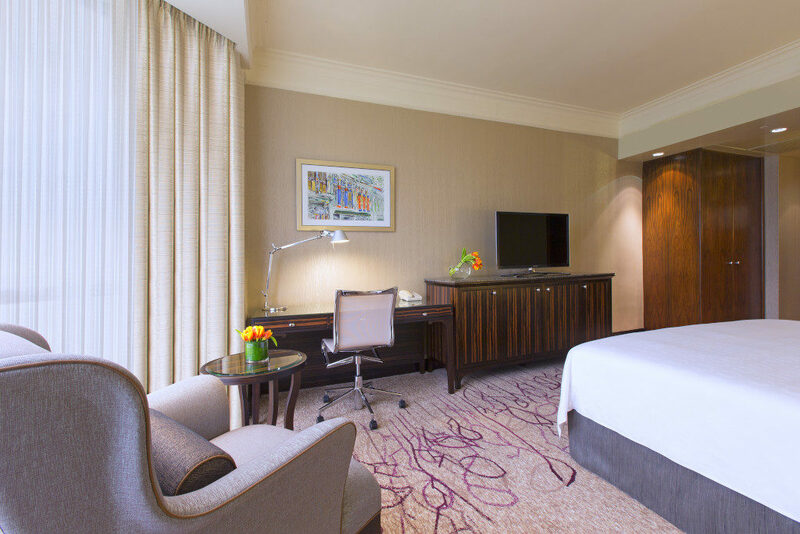 Mark the Easter break with a short getaway at Sheraton Towers Singapore. The Fun Easter Package includes a decadent breakfast buffet spread and a surprise Easter treat! Available till 25 April 2019. 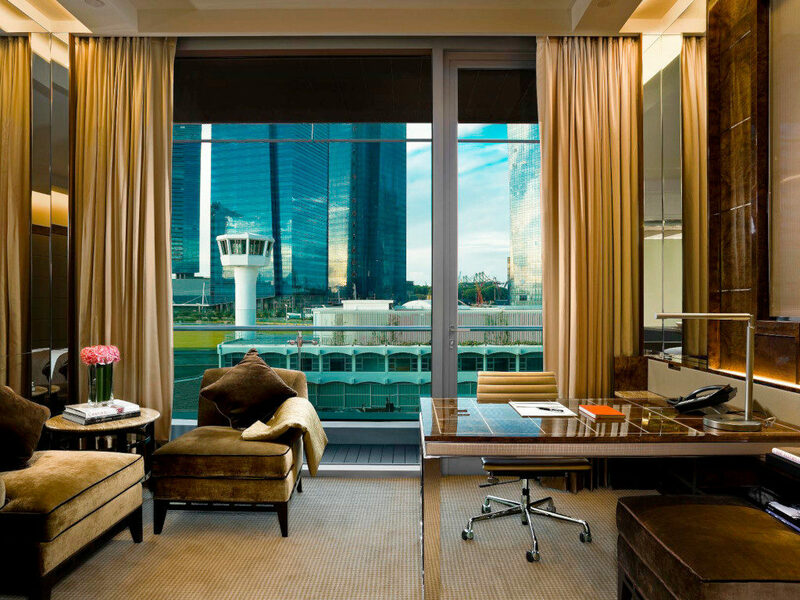 For reservations or enquiries, call 6839 5755 or email reservations@sheratonsingapore.com. 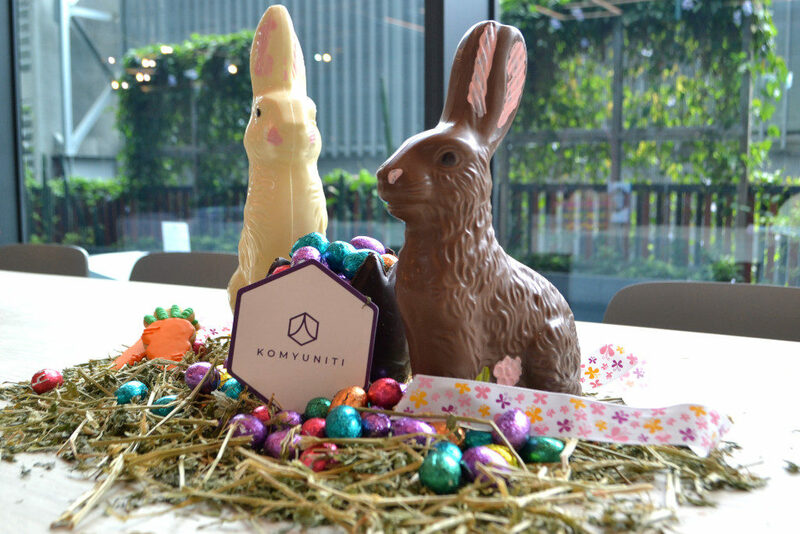 Guests who book an overnight stay during Easter weekend at YOTEL Singapore can experience all the Easter activities. This 2D1N Room Bundle Package includes a Premium Queen with Bunk Room that sleeps up to four, plus free entry to the Easter Brunch Buffet. Available from 19 to 21 April 2019. For reservations or enquiries, call 6866 8000 or email singapore.reservations@yotel.com. That’s all for now, yolks. Have an egg-cellent Easter!